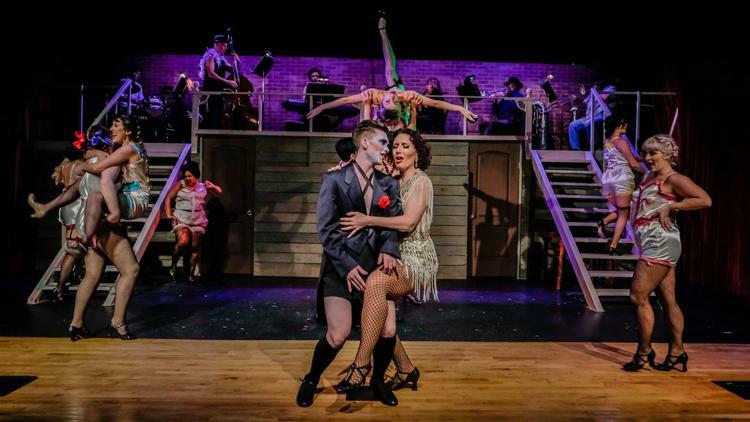 Coronado playhouse is at it again with another hot ticket production of “Cabaret” in their intimate space through April 28th. Winner of eight Tony’s in 1966, eight Oscar’s in 1977. The musical has been tweaked a few times to fit the times and in 1988 a reimaged production by The Roundabout Theatre where it added four more Tony’s to its collection. 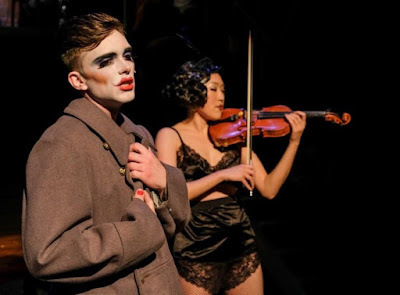 Kander and Ebbs’ musical “Cabaret” is based on Christopher Isherwood’s 1929 book “Berlin Stories”. They recount his experiences in Germany. To that he wrote, “I am a camera with its shutter open, quite passive, recording, not thinking”. It is here he meets Englishwoman, talented but lost soul Sally Bowles now living her life wrapped in drugs, alcohol and meaningless relationships in the waning years of Germany’s downfall before the rise of Hitler and his henchmen. In 1951 John von Druten wrote his play “I Am A Camera” starring Julie Harris, which later went on to Broadway and after that Harris stared in the film version of the same name. 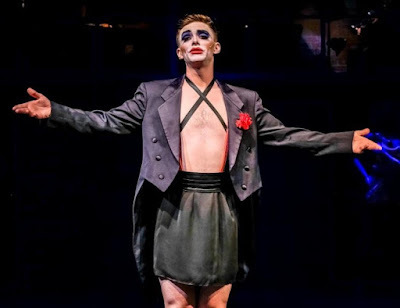 The big Hollywood musical having Sally Bowles fit the now American image as an ex patriot and singing in a cabaret that, according to then director Hal Prince, becomes a metaphor for the declining Weimer Republic. It forever memorialized Liza Minnelli as the American Sally Bowles and Joel Grey as the Emcee of the Kit Kat Klub. 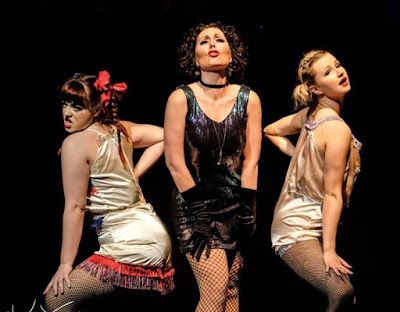 Sally Bowles (Sarah Alida Leclair: “Maybe This Time”) is still the main attraction around which this show revolves. Sally and her romance, on again, off again with American writer Cliff Bradshaw (Gabriel Macedo) are central to the story. She’s eccentric, he’s in awe and naïve, but falls hard for her over time. In between his homosexual tendencies and their bouts of affection, their ill fated romance never develops into anything too serious. As time and events unravel he becomes reviled by her ignorance of what’s going on outside the doors of the Cabaret. The only thing there is not to like about the new and revised “Cabaret” is that it always ends the same. The Nazi’s take over the country, the Jews are rounded up and sent to concentration camps, the world has gone mad and wars are mounted on two continents. But staging, directors and actors vary from production to production and on opening night, just as the performers were somewhat engaging, the overall production itself was uneven at best. Director Julia Cuppy has assembled a large cast of boys and girls i.e. Kit Kat Klub as they mingle with the guests before and during the show bringing in a more intimate atmosphere. When the show is in motion though, and at a fast pace, transitions from scene to scene are distracting and choppy interfering with the flow and continuity of the story. Chad Oakley’s set with stairs on both sides of the stage offers Kit Kat’s a place to sing and watch the show as it happens and be ready (if you will) for their next number. Four doors in the background are rooms for the renting with most of the girls entertaining sailors (they have money) who are not supposed to be there as long as Fräulein Schneider doesn’t see them. 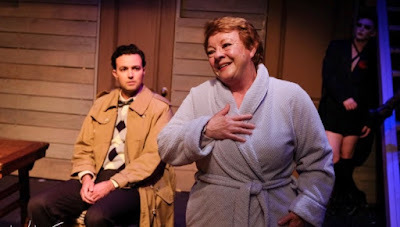 Sue Boland, the quintessential and charming Fräulein Schneider, always at the top of her game as the boarding house-house mother and owner perfects her “So What” number with authenticity. On counterbalance, sweet John Garcia’s Herr Schultz, (“Married”) the Jewish fruit merchant who always brings goodies, is as clueless as the rest. Hunter Brown’s (“Two Ladies”) spirited and boyish take on the Emcee is just what the doctor ordered. Getting caught up in the Kit Kat Klub was for him the ideal go between and he relished it exclusively. He, as the other’s, thought the party and ongoing decadence would last forever. So much for assuming. Sarah Alida LeClair’s “Don’t Tell Mamma” (“Perfectly Marvelous”), “Maybe This Time”, “You have to understand the way I am Mein Herr”, and “Cabaret”, has the right voice, strong and oft times soaring, is somewhat convincing as the drug and alcohol induced Sally Bowles. As the object of Bradshaw’s affection and wanna be savior by rescuing her and whisking her off to his home city in Philly, he’s not an equal for her insatiable drive to be a star. Unfortunately the chemistry between Macedo’s Cliff and LeClair’s Sally is no convincing match either (“Perfectly Marvelous”). The lack of any visible dynamic between the two makes it a stretch to believe their relationship. Ian Brandon’s musical direction with the Kit Kat Band overlooking the action below is fine. Jaese Lecuyer’s choreography will need some polishing as the production picks up in the weeks to come. 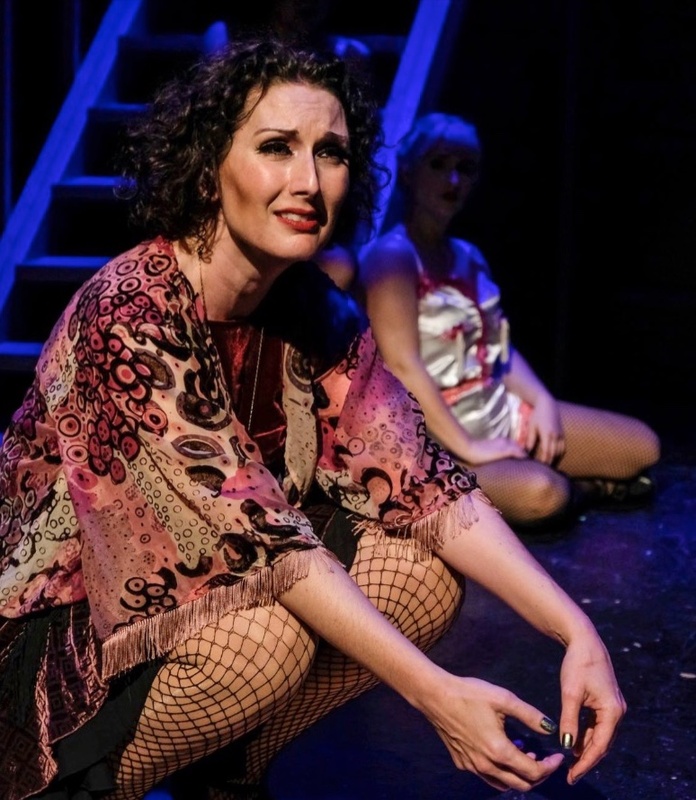 Lisa Burgess’s costumes fit the bill and Adam Cuppy’s sound design helps accent the highs and turning tides at the Kit Kat Klub.